Well, OK, I was bit off the mark way back then. 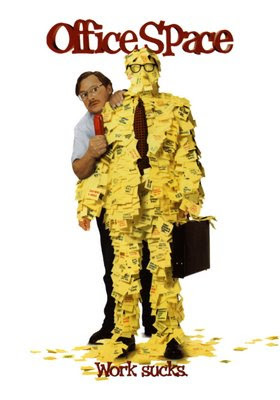 But never mind: Even though it was a box-office under-achiever during its initial theatrical release, Office Space has remained enduringly popular as a top-selling DVD and cult-fave cable-TV offering. And now, to celebrate its tenth anniversary, this contemporary classic is returning to the scene of the crime -- i.e., Austin, Texas, where it was filmed -- for a special one-time-only screening event Feb. 8 at the city's historic Paramount Theatre. Co-sponsored by SXSW and Fantastic Fest, the shindig -- tied to the Feb. 3 Blu-Ray release of Office Space -- will include special appearances by Judge and yet-to-be-announced members of the cast and crew. You can order advance tickets here or here. And you can get updated info on the screening here. But please keep in mind: If you attend, don't you dare touch anybody else's stapler. At least, not unless they ask you to.